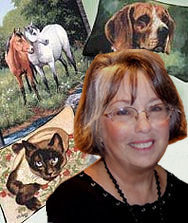 Linda Picken lives in America's Ozarks where she revels in the country life surrounded by a menagerie of dogs, cats, horses, ducks, Canada Geese, and an assortment of other birds and wildlife. Her love of animals is evident in her paintings of dogs, horses, and wildlife, which reveal the joy, humor and majesty of the animal kingdom. Linda studied at the Des Moines Art Center, majored in art at Drake University, and then very ably developed her own style of wildlife and animal portraiture. She is an award-winning artist, named an Honorary Trustee of Ducks Unlimited and recipient of its first Silver Palette and Chisel award. Dozens of her paintings have been selected to help raise funds for conservation. Her art graces the covers of many magazines and catalogs. Her work has also been selected for high-quality collectors plate series, greeting cards and numerous other gift items, including the Christmas stockings, tapestry pillows and afghans. © 2005 Linda Picken Art Studio, Inc.